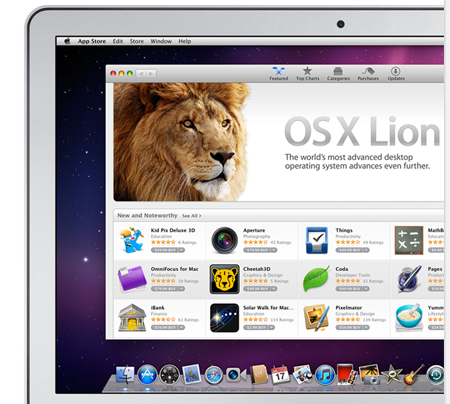 Apple will be releasing, perhaps as early as July 9th, its latest version of Mac OS X, Lion. Unlike with previous OS X updates, Lion will be significantly cheaper ($29,00), but getting your hands on a physical disc copy of the Lion upgrade will not be possible. This will be because, for the first time, this OS X update will only be available for download through Apple‘s Mac App Store. As of this writing, Apple has not indicated that it will provide hard disk copies of Lion. This new method system of updating has its pros and cons, but having downloaded the developer’s build of Lion, I think for many previous users of the Mac App Store, the process should further simplify new system upgrades. 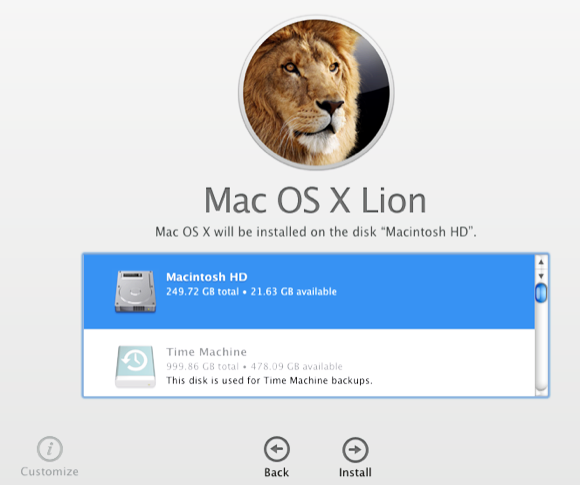 This article does not address all the questions users may have about the Lion upgrade. After the system is fully released, we will address any other major issues (if any) that may arise with the upgrade. In order to upgrade to Mac OS X Lion, the Mac you want to install it on will need to be at least an Intel Core 2 Duo, Core i3, Core i5 or Core i7 processor. I believe most Macs produced in the last five years meet one of these qualifications. To find out which processor your Mac is using, click on the Apple icon > About. 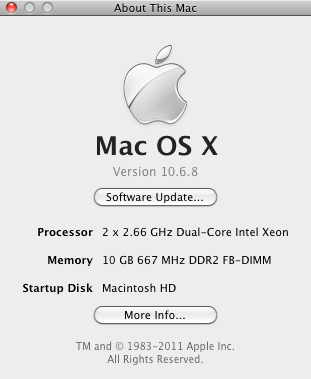 You will need to be running the latest update of Snow Leopard 10.6.6. (See here for more information about the App Store upgrade). This SL update should include the Mac App Store application in which you use to purchase and download Lion, as you would any other applications in the store. The developer’s build of Lion that I downloaded is over 4GB, and more than likely it will not be any smaller than that in its final release version. So once you pay for Lion, be prepared for a 30 minute to 2 hour download time, depending on the speed of your network. You will want to make sure you have backed up your existing hard drive onto Time Machine and/or cloned it to another external drive. If you need to install Lion on other Macs in your home, you can open App Store on those computers and click on your Purchases (located in the App Store menu bar) to download the installer app again to those other Macs. However, instead of another download through a Wi-Fi connection for your other Macs, you probably should be able to copy the Lion installer app via your networked computers or through a FireWire or Ethernet connection so that process is a little faster. What’s great about downloading Lion from the App Store is that the process will begin once downloading is complete. Most users will simply download Lion on top of Snow Leopard, which means that the new system will replace Snow Leopard but all your existing files, applications, songs, movies, and other data will be remain intact, and will appear after you restart your computer with the newly installed Lion upgrade. 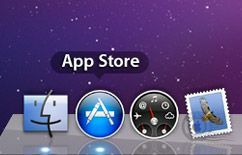 There will be a Customize button that you can click to selectively exclude any default Lion apps, system foreign languages and the like that you don’t want installed in the upgrade (in the developer’s build of Lion the ability to customize the installation was not yet available). After you’re done with the installation app, you can delete it from your Application’s folder, as once you purchase it in the App Store it will always be there for to download again if need be. The big issue with this App Store process is you won’t have an external copy of Lion on disk to plop into your Mac just in case you need to run a fix on a corrupted disk or partition. If you need to, you can install Lion on a separate partition or external drive, so that you can have access to both Snow Leopard and Lion. Why might you want to do this? Well, some applications like older versions of Microsoft Word will not run on Lion, and you’re not prepared to upgrade the software for Lion just yet. So to create a partition, you will need to make sure you have plenty of internal hard drive space. I would recommend at least 12-20 gigs of space on the partition. 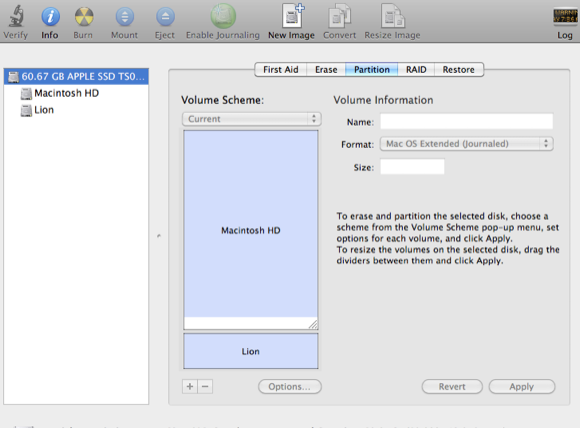 You can create a partition by launching Disk Utility and selecting your hard drive. Click on the “Partition” tab and then click the + button at the bottom of the Volume Scheme. Name the partition “Lion” or any name you like. Set the partition size for Lion to be about 12-20GB. Click the “Apply” button and the partition will be created, similar to how it’s shown above. You can switch back and forth between systems by opening System Preferences and selecting “Startup Dist” under the System category. From there, you can select the system you want your computer to start back up in. Your Mac will boot in the last system you used. Let us know how your download and installation process goes. Also ask questions and share problems with your Lion upgrade experience and we may be able to address them in future MUO articles.